AeonAir 45 Pint 2 Speed Auto Restart Dehumidifier RDH45EB. Aeonair 45 pint dehumidifier helps to remove dampness, alleviating mold and mildew while at the same time being efficient with it's energy star rating. The aeonair dehumidifier is best suited for a room size area up to 2500 sq. ft. This Aeonair 45-Pint Dehumidifier has a 45-pint capacity and an adjustable humidistat. Its temperature setting can operate as low as 41 degrees Fahrenheit. The auto de-icer prevents ice buildup on coils. You can remove moisture from the air easily using this programmable dehumidifier in any room of the home. It can cut down on fungus and other growths that can occur when the air is too moist. Protect your items, your home and your family by using this dehumidifier. It lets you know when the bucket is full so you can drain the water from it. Buy this and Get 57% Off AeonAir 45 Pint Energy Star 2 Speed Dehumidifier with Auto Restart + Free Shipping. Get 53% Off Whynter 40 Pint Energy Star Dehumidifier! Whynter 40 Pint Energy Star Portable Dehumidifier RPD-421EW. The Whynter Energy Star© RPD-421EW portable dehumidifier is compact unit with an outstanding capability of removing up to 40 pints of moisture from the air per day. This unit creates a very efficient and space-friendly drying solution to any home or workplace dealing with high levels of humidity. This portable dehumidifier can be continuously operated with 2 drainage options; manual drain and gravity drain. The Whynter Energy Star© RPD-421EW portable dehumidifier includes a 7-pint bucket that can be removed and emptied. A bonus drain hose attachment is included with the unit for your immediate convenience. Buy this and Get 53% Off Whynter 40 Pint Energy Star Dehumidifier + Free Shipping. AeonAir 70 Pint 3 Speed Dehumidifier w/ Auto Restart & Pump RDH70EDP. Ensure that your favorite spaces feel fresh and inviting through the year by using this AeonAir RDH70EDP dehumidifier. Tackle dampness, mold and mildew growth using this unit which features an adjustable humidistat and offers 3 fan speeds. The highlight is a built-in pump which can discharge water vertically up to 13.1', out through a window or into a sink. Thanks to an anti-frost feature, this unit can function at temperatures as low as 41° F to keep you content and calm. So buy this and Save 50% Off AeonAir 70 Pint 3 Speed Dehumidifier with Auto Restart and Pump + Free Shipping. Danby 50 Pint Auto Restart Direct Drain Dehumidifier GDR50A2C. A portable dehumidifier is the perfect solution when it comes to removing unhealthy and uncomfortable moisture from the air. This chic unit can remove up to 50 pints (23.7 litres) of it every 24 hours. Depending on the specific conditions ideal for large areas up to a total of 3,000 square feet. This appliance offers unmatched styling and quality with two quiet fan speeds, automatic restart and de-icing features and a direct drain system which allows for continuous operation. The R410A refrigerant is environmentally friendly and the electronic digital panel makes it a simple appliance to control and monitor. You’ll be able to operate the humidifier in temperatures as low as 5ºC (41F) because of the clever low-temperature feature. The easy-to-remove filter makes it a breeze to clean and you can conveniently move the dehumidifier from room to room with the aid of the rolling castors. Buy this and Save 50% Off Danby 50 Pint Dehumidifier with Auto Restart and Direct Drain + Free Shipping. Versonel Electric Wall Mount Infrared Indoor Outdoor Heater VSLWMH100. The Versonel VSLWMH100 Wall Mount Indoor Outdoor Heater has the ability to transfer heat to a person or object without heating the surrounding air. The VSLWMH100 is commonly used for indoor or outdoor spot heating (use in covered outdoor areas only). Perfect for garages, outdoor patios, indoor pools or workshops. The universal wall and ceiling mounting bracket is easy to install and adjustable to suit your needs. The Infrared Quartz Radiant heater contains an infrared quartz heating tube and formed reflector heating system that provides even heat distribution. It saves 30%-40% on electricity compared to a traditional heater, with up to a 10,000 hour life span. Reflective heating technology replicates the sun’s healthy rays, directly warming the object or person in front of the heater. As the temperature of the heated surface rises, the warming effect is felt throughout the air and surrounding areas. Reflective heat is both safe and healthy – it produces no odors, chemicals or fumes and doesn’t stir up dust. Remarkably efficient, our heater uses less power to create the same amount of heat as traditional heaters. Universal wall and ceiling mounting bracket for easy installation with any standard 110/120V outlet. Horizontal mounting only. Buy this Heater and Save 57% Off Versonel Electric Wall Ceiling Mount Indoor Outdoor Infrared Heater + Free Shipping. Save 47% Off LifeSmart 24" 2 Element Infrared Tower Heater. LifeSmart 24" 2 Element Infrared Tower Heater and Fan PCHT1053US. Keep warm this winter and fall when you use your Lifesmart 24-Inch Tower Infrared Heater and Fan. Warm up that cold spot in the room or place the heater next to your couch while you curl up and watch a movie. You'll love how toasty you feel when you bask in the warmth of the Lifesmart 24-Inch Tower Infrared Heater and Fan. This infrared heater supplements the heat of your home and reduces energy costs by only warming up the room you're occupying. It runs on 2 heat settings - 1,000 or 1,500 watts. The heater is loaded with safety features like the overheat and tip-over shut off switches as well as a cool touch exterior. Utilize this unit by zone heating the rooms you spend the most time in. Zone heating allows you to only heat the rooms you are in the most and helps save you reduce energy consumption. Buy this Heater and Save 47% Off LifeSmart 24" 2 Element Infrared Tower Heater + Free Shipping. LifeSmart 6 Element Quartz Infrared Portable Space Heater PCHT1012US. Lifesmart offers ultra-efficient and safe heat than other heating systems. This heater and features 6 of our standard quartz infrared elements there is also a Lifetime Air Filter. In house testing shows our heaters are 38% more efficient then forced air electric, 66% more efficient then propane and 45% more efficient then electric baseboard yet this Infrared Heater only uses up to 1500-Watt which is no more than a common hair dryer. There are 3 energy savings settings including an Eco Setting that will heat smaller areas to 68˚ using only 500-Watt. The heater is surrounded by our stylish black fireproof metal cabinet that is cool to the touch. E Z Glide casters will easily move from the heater from room to room. This amazing heater also includes a new larger remote control to operate the Digital Thermostat and Dual Timer settings that can be used to turn the unit on in up to 12 Hours ahead so your room is warm when you come home or turn off in up to 12 hours. So buy this Heater and Save 38% Off LifeSmart 6 Element Quartz Infrared Portable Space Heater + Free Shipping. Save Up to 57% Off Infrared Space Heaters & Indoor/Outdoor Heaters!! Save Up to 57% Off Infrared Space Heaters & Indoor/Outdoor Heaters + Free Shipping from 3Gorillas.com. Shop Now. No Coupon Needed. Get 53% Off Whynter 40 Pint Energy Star Dehumidifier. Whynter 40 Pint Energy Star Portable Dehumidifier RPD-421EW. The Whynter Energy Star© RPD-421EW portable dehumidifier is compact unit with an outstanding capability of removing up to 40 pints of moisture from the air per day. This unit creates a very efficient and space-friendly drying solution to any home or workplace dealing with high levels of humidity. This portable dehumidifier can be continuously operated with 2 drainage options; manual drain and gravity drain. The Whynter Energy Star© RPD-421EW portable dehumidifier includes a 7-pint bucket that can be removed and emptied. A bonus drain hose attachment is included with the unit for your immediate convenience. The Whynter RPD-421EW provides cost-effective and energy-efficient operation, without sacrificing design and performance. Designed for space constrained usage, this unit is suited for enclosed areas up to 2500 sq. ft. And buy this Get 53% Off Whynter 40 Pint Energy Star Dehumidifier + Free Shipping. AeonAir 70 Pint 2 Speed Auto Restart Dehumidifier RDH70EB. Aeonair 70 pint dehumidifier helps to remove dampness, alleviating mold and mildew while at the same time being efficient with it's energy star rating. The aeonair dehumidifier is best suited for a room size area up to 3800 sq. ft. Keep the air throughout your space comfortable with this Aeonair 70-Pint Dehumidifier. This dehumidifier works by pulling in moist air that is moved over the unit's coils, where the moisture is then collected. The unit then pushes out the dry air and circulates it throughout the area. With two fan speeds and a programmable 24-hour timer, the Aeon air dehumidifier can conveniently be customized to meet your needs. Its low temperature setting operates as low as 41 degrees Fahrenheit, and the auto de-icer prevents ice build-up on the coils to keep the unit running efficiently. For convenient and simple maintenance, this dehumidifier features a direct drain option as well as a removable filter. The unit is also equipped with rolling caster wheels for easy maneuverability. This programmable dehumidifier is ENERGY STAR qualified. So buy this and Get 47% Off AeonAir 70 Pint Energy Star 2 Speed Dehumidifier with Auto Restart + Free Shipping. Danby Premiere 70 Pint Energy Star Dehumidifier with Pump DDR070BBPBDB. This unit works best in an area of up to 4,500 square feet. With its Energy Star® rating and environmentally-friendly R410a refrigerant, this unit will cut your electricity bills and help the ozone layer. Between a low and high fan speed, you are able to control either speeds with its electronic digital panel. The de-icing feature will ensure that your coils will always be ice-free. There’s a low-temperature feature which enables the dehumidifier to operate in temperatures as low as 41F (5ºC). It’s convenient to relocate from room to room due to the handy built-in rolling castors. The automatic restart feature will turn the appliance back on after a power failure. When it comes time to clean the filter it can easily be removed, washed, and quickly re-inserted. So buy this and Get 40% Off Danby Premiere 70 Pint Energy Star Dehumidifier with Pump + Free Shipping. Danby 50 Pint Auto Restart Direct Drain Dehumidifier GDR50A2C. This chic unit can remove up to 50 pints (23.7 litres) of it every 24 hours. Depending on the specific conditions ideal for large areas up to a total of 3,000 square feet. This appliance offers unmatched styling and quality with two quiet fan speeds, automatic restart and de-icing features and a direct drain system which allows for continuous operation. The R410A refrigerant is environmentally friendly and the electronic digital panel makes it a simple appliance to control and monitor. You’ll be able to operate the humidifier in temperatures as low as 5ºC (41F) because of the clever low-temperature feature. The easy-to-remove filter makes it a breeze to clean and you can conveniently move the dehumidifier from room to room with the aid of the rolling castors. So buy this and Get 50% Off Danby 50 Pint Dehumidifier with Auto Restart and Direct Drain + Free Shipping. Save Up to 53% Off Dehumidifiers + Free Shipping! 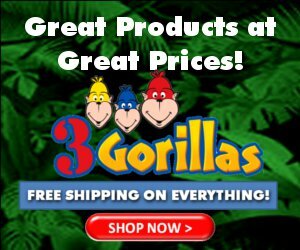 Save Up to 53% Off Dehumidifiers + Free Shipping from 3Gorillas.com. Shop Now. Save 25% Off Versonel Nightwatcher Pro LED Security Motion Tracking Flood Light with Color Camera & WiFi + Free Shipping. Shop Now. Up to 54% Off For Portable Air Conditioners!! Save up to 54% Off For Portable Air Conditioners + Free Shipping. And More Portable air conditioners offer portability with many functioning as a dehumidifier as well. We have units from Danby, Soleus, Edgestar and more. We have 10,000, 11,000 and 12,000 BTU options many which offer heat as well for rooms up to 200 square feet. Danby 60 Pint Energy Star Dehumidifier Auto Restart w/ Pump DDR60A3GP. Get Relief From Summertime Humidity & Damp Basements! The unit is designed to take out 60 pints of water (28.4 litres) every 24 hours and depending on the specific conditions can work its magic in areas up to 3,600 square feet in space. The water is conveniently removed via the direct drain and integrated-pump unit. This model boasts the well-known Energy Star rating which means helps to conserve electricity and keep your costs down. The R410A refrigerant also makes it an environmentally-friendly device. The dual fan speeds can be easily set with the modern Electronic and remote-control system and the coils are kept free of ice buildup due to the automatic de-icing unit. The dehumidifier also has a clever auto-restart feature in case of a power failure and the low temperature device enables the machine to operate continuously until the temperature reaches 5�C. Cleaning is a simple task with the handy removable air filter and the convenient castors make this model easy to transport. So buy this and Save 63% Off Danby 60 Pint 2 Speed Energy Star Dehumidifier with Auto Restart and Pump DDR60A3GP. Plus Free Shipping. The Friedrich D25BNP Dehumidifier controls humidity in small- to medium-sized spaces. This portable dehumidifier is equipped with an easily accessible drain bucket and continuous-drain capabilities for worry-free operation. The humidity level can be set from 30% to 90% relative humidity and the dehumidifier operates in temperatures as low as 41 degrees Fahrenheit. Additionally, four rolling casters provide easy mobility for effective humidity control from room to room. So buy this and Get 40% Off Friedrich Energy Star 25 Pint Dehumidifier with Continuous Direct Drain Option D25BNP Now $149.95 + Free Shipping. Save up to 63% Off Dehumidifiers + Free Shipping. More Portable home dehumidifiers reduce the amount of humidity in the air. We have units from Danby, Soleus, and Slyvania. These room dehumidifiers are available in various pint capacities ranging from 25-70 pints and with a variety of speed control options. Haier 10,000 BTU 3-in-1 Portable Air Conditioner Dehumidifier. Multiple speeds for personalized comfort. Program the unit to turn on or off at anytime between 1 and 24 hours. Direct the air flow to where you want it. Cool the room, circulate the air or lower the humidity all in one unit. Control your comfort from anywhere in the room. Easy to install and fits most double hung and sliding windows. Move the unit easily. So buy this and Save 48% Off Haier 10,000 BTU Portable Air Conditioner with Dehuidifier Now $299.99 + Free Shipping. Versonel Portable Garage Toolbox Refrigerators. Every tough job deserves an equal reward. Why not have the toolbox that mixes the two? Versonel has combined the convenience of three working tool drawers with a built in refrigerator. The Versonel Toolbox Refrigerator comes in a traditional red or blue color that matches most garage and work area settings. The refrigerator blends perfectly to look like a toolbox while hiding your cold beverage stash from friends, spouses or bosses. Hey, we don't judge. Makes a great gift for the handyman with everything and the perfect addition to the man cave. Buy this and Save 27% Off Versonel Portable Garage Toolbox Refrigerators + Free Shipping. Versonel Smart Health Oil-Free LCD Air Fryer with Rapid Air. The Smart Health Air Fryer provides an easy and healthy way of preparing your favorite foods by using hot rapid air circulation without sacrificing texture or taste. Using our Advanced Smart Air Technology, our air fryer is able to make numerous dishes by heating food from all different directions giving thorough, even and delicious results without the excess oil! The air fryer offers you the flexibility to fry, bake, roast or even grill your food. So buy this product and you can Save 40% Off on Versonel Smart Health Digital Programmable LCD Air Fryer. Plus Get Free Shipping. The Smart+ Products SPP70SLW Robotic LED Security Light with Color Camera is a patent pending motion tracking feature built into a PIR lamp with LED floodlight and an integrated digital color camera. It detects an intruder's motion within the field of vision of the PIR and points the lamp directly at the intruder. As the intruder moves across the PIR field of vision, the motorized lamp head takes aim and follows. Each time motion is detected, the unit will turn on for 3 minutes pointed in the direction of the motion and the on-board color camera begins recording to a built-in SD card, capturing each moment. Active coverage area up to 10 meters, it has full detection range of 220 degrees. Programmable functions for all day or night only activation. The motorized LED floodlight saves you energy and extends the lamp life up to 30,000 hours. Buy this product and Save 53% Off for Smart+ Products Outdoor Robotic LED Security Motion Tracking Light w/ Color Camera Now $139.95 + Free Shipping. The Smart+ Products SPP30SLW detects motion within the 220° field of vision of the PIR and turns the lamp to point directly at the intruder. As the intruder moves across the viewing range, the motorized lamp head takes aim and follows, giving the appearance that they are being watched. The SPP30SLW also comes with an indoor wireless audio alarm, to warn you when an intruder nears your property. Buy this and you can Save 36% Off for Smart+ Products Outdoor Robotic Halogen Motion Tracking Security Light and Alarm Now $76.95 + Free Shipping. Smart+ Robotic 150W Motion Tracking Security Light, Black. The Smart+ Products SPP20SLB detects motion within the 220° field of vision of the PIR and turns the lamp to point directly at the intruder. As the intruder moves across the viewing range, the motorized lamp head takes aim and follows, giving the appearance that they are being watched. And buy this product you can Get 30% Off for Smart+ Products Outdoor Robotic Halogen Motion Tracking Security Light, Black Now $69.95 + Free Shipping. Soleus Air 13,000 BTU 4in1 Portable Air Conditioner Heater. Get cool and warm air, a dehumidifier and a fan where you need it with the Soleus Air 13,000 BTU Portable Air Conditioner with Heat and Remote. This portable unit can be placed in any room that provides outside ventilation and works as an air conditioner, heater, dehumidifier and fan. The unit features a 3-speed fan with oscillating WaveFlo vents and 2-way air circulation for great airflow control, and the soft touch controls and easy-to-read digital display allow for precise temperature adjustments. The 24-hour programmable timer and remote control offer ease of use. Buy this and you can Save 54% Off For Soleus 13,000 BTU 4-in-1 Portable Air Conditioner, Dehumidifier, Fan + Heater Now Only $309.99 + Get Free Shipping. Danby Premiere 11,000 BTU 3-in-1 Portable Air Conditioner. Danby is one of the largest household appliance marketing companies in North America, with an impressive lineup of compact, specialty and home comfort appliances to suit the lifestyles of today's consumer. With the integrated handles and castors you can easily roll this portable air conditioner from room to room. Installation of this air conditioner is simple, as the unit easily fits in slider and double hung windows. Portable Air Conditioner, Dehumidifier and Fan, All In One Compact Unit. Buy this and you can Save 47% Off on Danby 11,000 BTU 3-in-1 Portable Air Conditioner, Dehumidifier + Fan Now $299.99 + Get Free Shipping. Sylvania 8,000 BTU 3in1 Portable Air Conditioner Dehumidifier. The Sylvania SYL08PE 3-in-1 is a high quality, portable air conditioner and dehumidifier with fan. It has an emphasis on performance and reliability. The 8,000 BTUs cool a 120-200 sq ft room with 3 fan speeds, electronic control with remote and adjustable thermostat. The easy exhaust installation ensures superior portability when compared to standard models. And buy this you can Save 34% OFF on Sylvania 8,000 BTU 3-in-1 Portable Air Conditioner, Dehumidifier + Fan Now Only $299.95 + Get Free Shipping. Danby 5000 BTU 3-in-1 Portable Air Conditioner Dehumidifier. Get ready for summer with this 5000 BTU capacity portable air conditioner. With a coverage area of 110 sq. ft. this air conditioner is perfect for condos or apartments. It would also make a great addition to your bedroom or home office. The electronic controls, LED display and remote control allow you to easily control the temperature — anywhere from 16°C to 32°C. In addition to being an air conditioner, this unit is also a 45 pint dehumidifier and a fan. Buy this and you can Save 41% Off on Danby 5,000 BTU 3-in-1 Portable Air Conditioner, Dehumidifier + Fan Now $219.99. Plus Get Free Shipping. Save Up to 54% Off Portable Air Conditioners!! Save Up to 54% Off Portable Air Conditioners from 3Gorillas.com. Plus Get Free Shipping. More Portable air conditioners offer portability with many functioning as a dehumidifier as well. We have units from Danby, Soleus, Edgestar and more. We have 10,000, 11,000 and 12,000 BTU options many which offer heat as well for rooms up to 200 square feet. 33% OFF Deni 2 Qt Stainless Steel Pressure Cooker. Deni 2 Qt. Electric Pressure Cooker, Stainless Exterior - 9770. Shorten your cooking time by as much as 70% with the Deni 9770! This 2-quart electric pressure cooker relies on steam, heat, and pressure to cook up to 4 meal servings at once. The pressure cooker includes a non-stick interior and eliminates the need to use extra oils and fats as you cook. So buy this product and you can Save 33% OFF Deni 2 Qt Stainless Steel Pressure Cooker Now $49.95 Plus Get Free Shipping. 50% Off Deni 1.5 Quart Automatic Ice Cream Maker. Deni 1.5 Quart Automatic Ice Cream Maker with Bonus Candy Crusher - 5210. Fully automatic and easy to operate, NO salt or ice needed. Makes delicious ice cream in 10-20 minutes. New canister freezes in 8 hours. Candy crusher dispenses crushed candy into your favorite ice cream. Lid fits on unit and canister. Compact to fit anywhere. Makes up to 1.5 quarts. No long waiting. Freezes ingredients in less than half an hour. Make frozen drinks (i.e. Pina coladas, frozen daiquiris, or icy thick margaritas). Turn fruit and natural ingredients into frozen yogurt, sherbet, sorbet, and other low-fat frosty creations. Freeze canister, turn on, pour in fresh ingredients, and you can enjoy creamy, smooth frozen desserts in minutes. Hidden cord storage. Anti-slip rubber feet. 40 watts of power and compact to fit anywhere. So buy this product and you can Save 50% OFF on Deni 1.5 Quart Automatic Ice Cream Maker Now $49.99 Plus Get Free Shipping. 38% OFF Deni 9.5 Qt 3 Tier Food & Vegetable Steamer. Deni 9.5 Qt. Triple Tier Digital Food Steamer, Stainless - 7600. Make tasty meals with this food steamer that features 3 tiers, so you can accommodate a whole meal at once. The digital timer and LCD display make it easy to cook delicious foods. Provide enough heat to make a variety of foods from steaming vegetables, rice, seafood and meats to hard-boiling and poaching eggs. So buy this product and you can Save 38% OFF on Deni 9.5 Qt 3 Tier Food & Vegetable Steamer Now $42.99 Plus Get Free Shipping. Deni Small Kitchen Appliances - Save Up To 50% OFF!! Save up to 50% OFF on Deni Small Kitchen Appliances at 3Gorillas.com. Plus Get Free Shipping. Shop Now. No Code Required. 40% OFF Smart+ Infrared Portable Heater. Smart+ Products Quartz Infrared Portable Heater Electric. Energy efficient and convenient to use. The "Cool Touch" exterior cabinet makes this heater safe for kids and pets. The Infrared Heater Technology warms nearby objects and people in the rooms used most often and does not use carbon combustion. So buy this product and you can Save 40% OFF on Smart+ Infrared Portable Heater Now $94.99 Plus Free Shipping. Get 30% OFF Smart+ Infrared Quartz Fireplace Heater. Smart+ Products Electric Infrared Quartz Fireplace Oak. Energy efficient and convenient to use. The "Cool Touch" exterior cabinet makes this heater safe for kids and pets. The Infrared Heater Technology warms nearby objects and people in the rooms used most often and does not use carbon combustion. So buy this product and you can Get 30% OFF Smart+ Infrared Quartz Fireplace Heater Now $199.99 Plus Free Shipping. Save Up to 46% OFF Smart+ Heaters & Fireplaces. Save Up to 46% OFF on Smart+ Heaters & Fireplaces at 3Gorillas.com. Plus Get Free Shipping. Shop Now. No Code Needed. 40% OFF For Olympia Deluxe Folding Travel Garment Bag! Olympia Deluxe Folding Travel Garment Bag Hanging Luggage Black G-7740. This quick and easy to use garment bag is perfect for those short trips. Your clothes will look great upon your arrival. Great gift for the person who needs to keep there suits or dresses wrinkle free. Constructed of rugged polyester, this sturdy wheeled garment bag will serve you well. With multiple organizer pockets in tow, your clothes can remain tied down and wrinkle-free. Olympia Luggage has established a long tradition of high quality luggage with unparalleled durability and dependability. With designs always on the cutting edge, functionality, creative features, the latest technology and contemporary aesthetics - Olympia Luggage has risen to and remained at the head of the class. So buy this product and you can Save 40% OFF on Olympia Deluxe Folding Travel Garment Bag Now $34.99 Plus Get Free Shipping. 3Gorillas.com is a fun discount home appliance and home decor online super store. Our focus is to provice Great Products at Great Prices. We specialize in portable Home Appliances.